Goalkeeper Christian Walton has been recalled by Brighton & Hove Albion from his loan spell at Luton Town. The 21-year-old returns to the Seagulls to provide back-up for first-team stopper David Stockdale, after second choice Niki Maenpaa recovers from the shoulder injury sustained during Saturday’s FA Cup defeat at Lincoln City. Albion boss Chris Hughton told the club’s official website: “While Niki’s injury is not as bad as we first feared, he will be sidelined for a short period of time, and during his period of rehabilitation we will need goalkeeping cover for David Stockdale. On his departure, Walton said: “I’ve had a fantastic time here at Kenilworth Road. It’s been a brilliant experience for me being part of a great squad and playing in front of the unbelievable Luton fans. “I’d just like to say a massive thank you to everyone at the club for making me feel so welcome and wish Nathan and the boys all the very best for the rest of the season. He is now needed back here to ensure we have proper cover in the goalkeeping position. 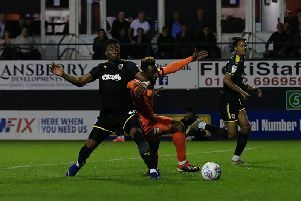 Walton played 33 times for Luton this season and had been a key part of a Luton defence which is the tightest in League Two this season. Speaking yesterday, Hatters boss Nathan Jones admitted he had plans in place should Walton be recalled, saying: “If that happens then we have contingency plans.